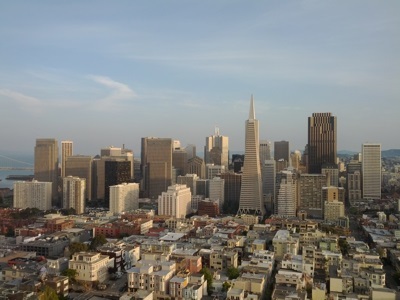 San Francisco is the 4th most populous city in California, and the 14th most populous in the United States. As of 2006, the city had an estimated population of 744,041. San Francisco is a popular tourist attraction, and is well known for its mix of Victorian and modern architecture, its seafood (especially in the Fisherman's Wharf area), and its large gay and lesbian population. There are many well-known sights in the city, including Alcatraz Island, the cable car system, Chinatown, the Coit Tower, the Golden Gate Bridge, Lombard Street (a street reknowned for its crookedness), the Palace of Fine Arts, and the Transamerica Pyramid. Moreover, thanks to the many movies filmed in the city, such as the Dirty Harry films, Bullitt and The Rock, many of these landmarks are familiar to people the world over, including people who have never been to San Francisco. There are also many cultural attractions in San Francisco. Opera, classical music and ballet are all well represented in the city, and there are many theaters some of which feature local productions, and others of which feature national touring productions of Broadway theater. Additionally, there are quite a number of museums in the city, including the San Francisco Museum of Modern Art (SFMOMA) which contains a wonderful collection including works by Ansel Adams, Marcel Duchamp, Paul Klee and Jackson Pollock, and the Exploratorium which is a science museum housed in the Palace of Fine Arts.